Thwarting harassment for the common good! @theheartbot is a Twitter bot that logs private reports of online abuse, replies to harassers with a disincentive, and keeps everyone else out of it. HeartBot is only available to registered HeartMob volunteers. To become a HeartMobber, sign up here. 1You DM @theheartbot with a link to an abusive tweet. 2The HeartBot will DM you with a link to confirm you are a HeartMobber. 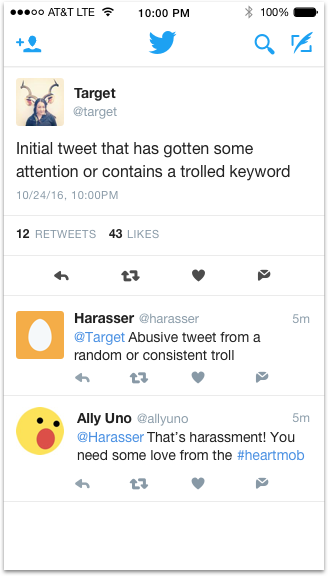 3The HeartBot replies to the harasser — it won’t mention you or the target! Need or want to give some public support in the face of a Twitter troll? Use and watch the #HeartMob hashtag to alert others that someone needs support. Be educated – read our Twitter Safety Guide before you tweet, understand what constitutes harassment, and follow any official protocol. Start with support — our first and most important job is to reduce trauma for the target. Don’t harass the harasser — the HeartMob is about educating harassers on what’s okay. We fight fire with water. Read our Twitter Safety Guide first. Block, mute, and report the harasser. If you want help documenting or reporting the harassment, create a report with us. We couldn’t do it without supporters like you.